Ever seen a rose stand up and say 'Howdy'? Vavoom has the color that'll do the trick. 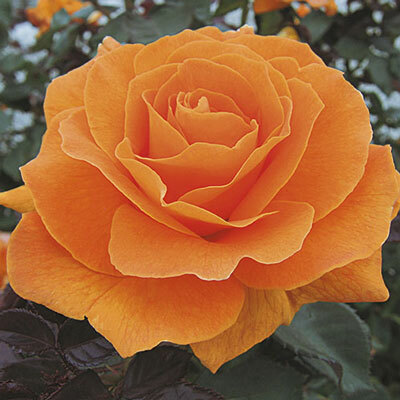 Its bright orange juice tones might make your eyes pucker…but its sweet treat of glowing color lasts to the very end of every long-lived blossom. Put that gleaming orange against deep mahogany red new growth & glossy green leaves & you've got a lollapalooza for the landscape. The rounded compact plant can tuck into limited spaces. Caution: Sunglasses may be required! Improves with establishment.